I bought another pair of these trousers only because I have lost weight. The originals remain in great condition and these are the same quality a number of years after I bought the original pair. I find these trousers have good, acuurate sizing, are warm in winter with the liner and definitely keep you dry in in the rain. I was after a pair of waterproof textiles which would zip to my alpinestars jacket for winter commuting, and so far these haven't disappointed. They have so far been warm in sub zero temperatures (although my commute is only 15 miles), and have survived a couple of downpours without leaking. My only criticism would be that they could do with an extra length of velcro to close the side of the ankle, which is designed to fit over boots. Usual first class service from SBS. 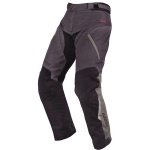 Really good value trousers, and as with all Alpinestars kit the fit is good. Warm in winter but lack of vents prevents them getting 5 stars from me; I reckon it'd be too warm for summer even with the 'layers' removed. A great product. Time will tell but I fully expect years of use. Really wanted these in black, and was anxious about colour, but these pants go great with the black jacket counterpart as the colours are darker than on the photo. They fit fantastic, nice and warm and lightweight but I've not had a chance to test them in the rain yet, but the quality is great. Should have ordered size down as they come slightly large but otherwise a great product. They are well made, with good solid material. Sizing is good, I'm a 36 waist and a large is a snug fit. I also went for the short leg as I'm generally a 29 leg and again very happy. They come with detachable braces which I didn't know. My only gripe is they don't have a zip on the lower leg only Velcro, looks a little baggy hence the 4 stars. Overall very happy with the quality size and of course the service. Same as the jacket, warm and dry. The trousers are well made and of good quality, for the price you couldn't ask for more. I can't wait to use them with my Andres Drystar jacket I bought previously. They are well made and feel good quality (as are all Alpinestars products). Legs seems to be slightly too long but I went with one size up for more baggy size, so I can wear them over my normal trousers in the winter. 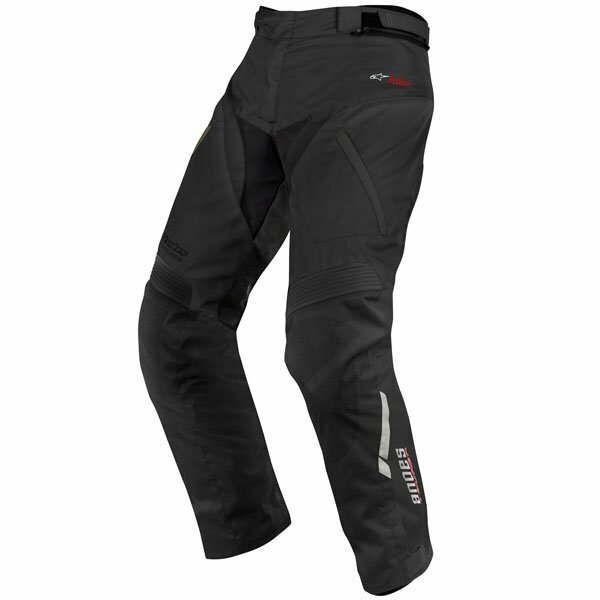 They have no zips or velcro straps at the bottom of legs (as my previous trousers) and they are loose, allowing wind to get in while riding, which is annoying (hence 4 stars). I will have to improvise in winter or go with thicker boots. These trousers are a good match for the Andes jacket. They are very comfortable to wear, have useful pockets and vents. They come with detachable braces and a full length connecting zip. The built in waterproof membrane and a zip in/out thermal liner make them all season trousers. The only drawback is the lack of length options for each waist size and adjustment for the knee armour position. A good value product. Comfortable, breathable, waterproof. A little on the large, I'm a 34 inch waist and the Medium size is almost too big. This was the 4th pair of trousers I tried from Sportsbikeshop - amazing customer service. Just like the Jacket the Pants are brilliant. These are comfy and reasonably cool with the thermal liner removed in hot weather - not yet tested in wet. I would not rely on the armour as the fit is too loose and you cannot strap it into position. I already have the Andes jacket so naturally I purchased the trousers to match. They are great trousers. Waterproof, comfortable, warm with the liner, still comfortable without the liner too. Knee armour sits perfectly too when on the bike. They are held up with braces which are adjustable. Pockets just above the knee are very helpful too. Rode in heavy rain with my dad and brother and wearing my Andes kit i kept fully dry, wholly recommend. For the price too you could not ask for more. Great trousers. Waterproof. Cool in the hot weather without liners. Not tried in cold weather. Adjustment is excellent. Knee armour is low when off the bike but is perfect when seated. Highly recommended. Excellent light weight trouser. Used in heavy rain first time out and stayed dry. Not that warm without the thermal liner, but fine with it in. Unlike the jacket, trouser sizes are quite large. I am 5 foot 10 and the short fitted fine. Waist size is also reasonably generous. Warm, waterproof and has a jacket joining zip that doesn't require the wearer to be a contortionist to fasten! Good, comfortable trousers! I liked the idea of the integrated braces, but took them off, as I need to wear the trousers as low as possible, I'm 6' 2" and they can ride up a bit. I bought the pants over the internet without trying on beforehand and hey fitted perfectly. After using them the 1st time I was convinced I had made the right decision. It was cold and wet but the pants kept me warm and dry. Excellent.